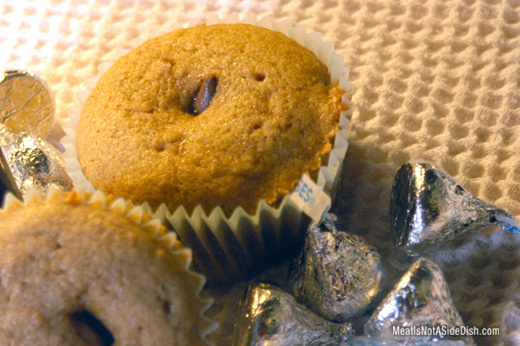 To make these Sweet Potato Muffins with Chocolate, start by preheating the oven to 350F. Measure each of the dry ingredients, combine in a bowl and then set aside. In another bowl, cream the butter with the sugars then add one egg at a time. Add milk and vanilla, then sweet potatoes and mix until smooth. Add dry ingredients a little at a time until fully mixed. Spray each muffin cup with non-stick spray and then fill each cup 3/4 full and bake for 5 minutes. Take them out of the oven and add 1 piece of chocolate by pushing down half-way into the batter. 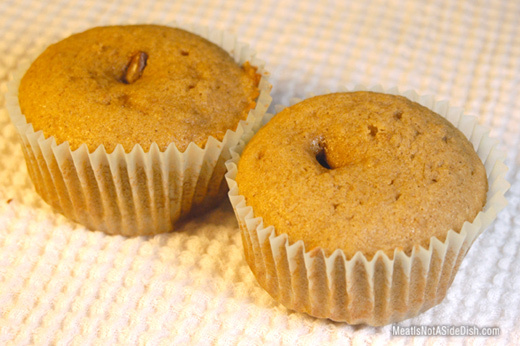 Return muffins to the oven and bake 12-14 minutes. Let cool when they are done.